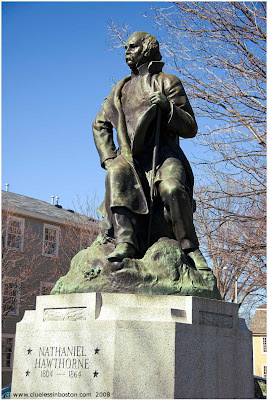 Statue of Nathaniel Hawthorne, favorite son of Salem, Massachusetts and author of Scarlet Letter and House of Seven Gables. This statue is by Bela Pratt, who also did the statue in Nurse's Hall in the State House. He was only 60 when he kicked off! That's scary. Looks very politician-like!!! No one smiles when they are posing for a statue hey - wouldn't he look better with a big cheesy grin??? Thanks you for your kind words on my blog - it is because of you I don't throw it all in the drink!!!! Oh I remember that gorgeous Nurse's Hall photo toooo! I like the statue, but I was not a big fan of his work (as I mentioned when you did the House of Seven Gables).